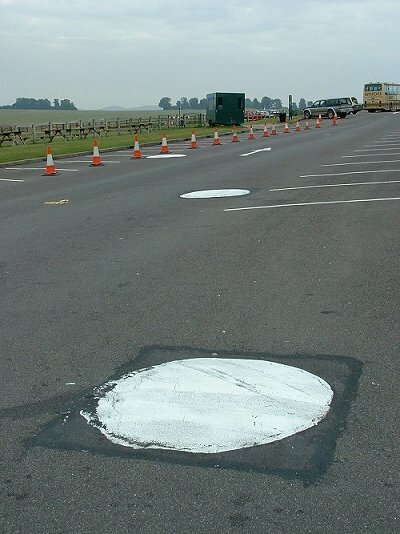 Largely unnoticed and ignored by the daily influx of visitors to Stonehenge are three round white concrete discs set into the tarmac of the site's car-park. Measuring about a metre across these discs mark one of the most interesting yet least understood phases of the development of the Stonehenge landscape. During excavations for the building of the car-park, three pits were discovered which contained pieces of bone and fragments of charcoal - the pits had evidently held large wooden posts. When this pine charcoal were carbon dated it was found to be some 10000 years old, over twice the age of any other structure at Stonehenge. At this time the during the Mesolithic period the whole area would have been covered with forests of birch, pine, hazel, oak and elm with scattered patches of open grassland. As yet we know little about why these three timbers were erected, whether an area was cleared, whether it was a natural forest glade, or even how tall the timbers were. If and when the whole Stonehenge area is redeveloped, with the road, car-park and visitors centre removed, we may find further clues to explain the function of this enigmatic structure.